What does the blue flag means? 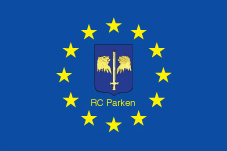 The EU flag with the two lionheads and a sword in the middle is the logo of "RC Parken"
What do the three wings mean? 1. 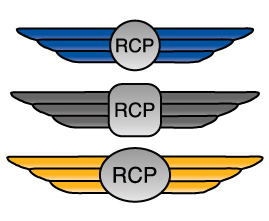 The symbolic meaning is that we are having three branches of our wonderful hobby in "RC Parken"
"Silver wings" as these wings are called are worn by members of the management of "RC Parken"
"Gold wings" as these wings are called are worn by members of the board of "RC Parken"